When we scheduled our Hard Mode kill order for our 25 man progression team, we placed Sindragosa last…right before Lich King. To be perfectly honest, we were simply dreading the encounter. After struggling for weeks with Hard Mode Putricide we were a little anxious going into Sindragosa, and worried about how we would handle the intricacies of the encounter. However, I am sometimes surprised at our adeptness for certain things. As it turns out, when using a K.I.S.S. (keep it simple stupid) strategy for the fight, it isn’t quite as bad as you’d think! Now, I know that the fight has been around for quite some time. I know that the first kill was months ago. However, there just aren’t a lot of strategy discussions out there for people looking for tips on dealing with the encounter in Hard Mode, which is still a bit of a challenge even with the ICC buff. As such, I thought I’d share our relatively simple approach to the encounter. Tanks: 2 – both in frost resist gear. We had ours use the 3 epic crafted plate items. Having Sindragosa’s Flawless Fang helps a ton, but isn’t required. Healers: 7 – You will always have 3 healers afflicted with unchained magic each time Sindragosa casts it on the raid, which means that you will only have 4 active healers while the debuff is out!. DPS: 16 – We use 7-8 melee and 8-9 ranged. The Encounter: One really fairly simple thing about this encounter is that the basics don’t really change very much. Sure, there are added events that you need to deal with and adjust to, but the actual meat of the encounter remains the same. That being said, if you are going to make positioning changes, I strongly recommend “practicing” them on normal mode before moving over to heroic. Just flip it over to normal, and do a few runs without actually killing her (or when you are short people to work on it heroic) and work through the changes without the extra difficulty until people become familiar with them. I cannot state enough how valuable this is! No matter who you are if you have Unchained Magic, at any point in the encounter, you stop casting until it is gone. Period. This is the simplest way to deal with this debuff and prevent blowing your raid up. Be sure you are aware when you are afflicted! It is likely that you have cast one thing as unchained magic distributes out into the raid, giving you one stack of backlash. It’s not a big deal as long as you follow these instructions: As soon as you are selected, you stop what you are doing and run away from the raid. You need to be 20 yards out from the raid to avoid exploding on top of them. As soon as you have dropped your backlash, move back with the raid and simply wait for your debuff to drop before casting again. Note that simple things will cause you to gain backlash: Barkskin, Judging, Casting Frost Ward,etc. Anything that casts will cause backlash, so be very cognisant of what you are doing while you have Unchained Magic. Keep a Curse of Tongues up on Sindragosa. No, really! It will slow down her blistering cold cast, and will likely save a lot of people throughout your attempts. People who have a hard time remembering Ice Block positions should go get a classic add-on: Pen and Paper. Have them draw it out, and stick it to the corner of their monitor, to remind them where to go. So much is solved when people are in the proper position! As a side note, people should set their DBM to 10 yards and should de-select the option to have your range finder convert to 20 yards when it detects the heroic version of the encounter. This will make ice blocks in both phase 2 and 3 much easier to position properly. Phase 1 – As I said, the majority of this encounter remains the same, so I won’t be going over the basics of the fight, under the assumption that if you are working on Hard Mode, you already know the encounter itself. However, I just want to re-iterate that if you have Unchained Magic, you do not do anything while you are afflicted. As soon as you receive the debuff run away from the raid (20 yards out) to drop your backlash, then rejoin the raid and just hang out until the debuff is cleared and you can cast again! The fight can be done without risking blowing up the raid, so don’t chance extra heals or dps while debuffed. Just patiently wait for the debuff to drop. This will mean that you will only have four active healers anytime unchained magic is active, and Sindragosa always chooses three healers. To help counter this, have your paladins beacon the active tank and heal the raid. Their splash from Glyph of Holy light will help a ton! Remind your healers that they are ALL responsible for the tanks and the raid, and should contribute to each assignment as best they can. Make sure all of your healers can see Sindragosa’s cast bar and are on the look out for “frost breath”. Healers should time a heal to land on the tank as Sindragosa is finishing her cast. Druids, Holy Priests and Resto Shaman are very powerful for dealing with raid damage, however it’s important that they remember that the tank is just as high a priority for them as the raid! Resto Druid Tip! – Keep rejuv going on your 3 ranged/heal groups, while keeping wild growth on your melee. You should be able to keep a set of HoTs on your tank with minimal down time on your raid Rejuvs. Remember, the tank is just as important as the raid here! Remind your overzealous physical DPS (hunters and melee) that heals are in limited supply and they shouldn’t let their chilled to the bone stack past 3 or 4 unless they have a way to clear it or can heal themselves. While this is more important for phase 3, it has benefits for phase 1 as well. It keeps the raid close to their phase 2 ice block point. It simplifies moving out of blistering cold (only one way to run!). It gives the raid a lot of free real estate to run when afflicted with backlash. The Pull – We had a few mishaps with people dying before figuring it out. Ultimately we had our off tank run out and “pull” her, so that he was closest to her and was guaranteed to get smacked before anyone else. Our MT stayed back, closer to position. Once she came down, fixated on our OT, our MT taunted her and our hunters misdirected into the tank. Voila! No more dead people on the pull. Blistering Cold – Probably the hardest part about this phase is keeping your tank alive during blistering cold. What makes this so challenging is that in addition to Sindragosa knocking your tank around to the tune of 35k+ hits and breathing on him, 100% of your healers are running out of blistering cold while your tank, alone, stays in with Sindragosa. This means everyone is out of range, and in motion, for a period of time where your tank just took massive damage from blistering cold and is dealing with Sindragosa’s normal (massive) damage. Keeping the tank alive can be a challenge! Actually, it’s probably the biggest challenge in phase 1! To counter this, we had our tanks use Sindragosa’s Flawless Fang during blistering cold for the extra frost resist. 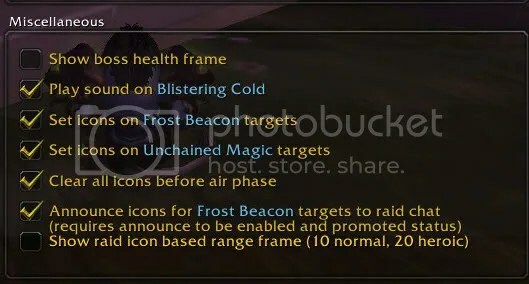 Additionally, you can have your paladins run Frost Resist Aura and pop Aura Mastery as they start running out to give your tank extra survival through the damage. Mitigating as much of the damage as possible from blistering cold will help keep your tank alive as your healers scramble back in a panic as they watch his life plumment. All healers that are able should make sure that the tank is HoTed and shielded sufficiently to survive until you can get back to healing! Resto Druid Tip! When you are sucked in for blistering cold, stack 3 lifeblooms on the tank as you are running out. You have just enough time to hit him with 3 before you get out of range. Let them tick and bloom. This will help keep the tank’s life stable while everyone is running back from blistering cold. It is important that everyone survives blistering cold, so this is just a reminder to have a warlock keep a curse of tongues up on her to give your raid additional cast time to get to safety! Even the slowest, laggiest, keyboard turning member of the raid will have time to make it to safety. Having 100% of your raid survive blistering cold every time is worth the dps loss to the warlock keeping Sindragosa debuffed. Your goal will be to get Sindragosa down at least 20% of her health each ground phase. Ideally you will see phase 1 three times (one being the phase 3 transition) and phase 2 only twice during the encounter. We opted to bloodlust after the second ice tomb phase, to push her into phase 3. Phase 2 – Unlike the normal version of this encounter, phase two requires complete perfection. Nobody can get hit with Sindragosa’s frost bombs. One frost bomb will kill you. One Ice Tomb broken early will wipe the raid. Ice Tombs – The difference here is that there will be six ice blocks as opposed to 5. The key to successfully getting in and out of phase two is ice block positioning. Period. Once you have that worked out, you can work out survival and timing on breaking them, but until you have your positioning worked out, this phase will very difficult to deal with. The most important thing for this phase is for everyone to know where the ice blocks need to be located. There are many options for positioning the ice blocks during this phase. However, opting to use your KISS principle, we opted to keep the positioning in phase two as close to how we learned it on normal mode as possible. As Sindragosa flew up into the air, the raid gathered up in front of the stairs, roughly right in the middle of where all of the ice blocks would be. Once the ice block targets were chosen, those without ice blocks moved to the stairs, and those with ice blocks moved into position. This allowed for the shortest travel time for those with blocks, and the greatest amount of time to get into position. You want each tomb to be exactly 10 yards from each other. So 10 yards from from thier front/back neighbor and 10 yards from the neighbor to their left or right..
One of the easiest ways to place the ice blocks to to find “focal points” on the ground for people to remember. For example, the blue box it 2 steps in front of the hashes in the dark grey on the ground. Once the ice blocks are formed and in place, the next thing that you have to worry about is keeping everyone alive through Sindragosa’s frost bombs…which is a lot trickier than you would think! Everyone in the raid must line of sight the bombs completely to survive. Use clock hands to help call out where the frost bombs are in relation to the tombs. i.e. 1 o’clock would be one that is slightly to the right of the tombs, where as 9 o’clock would be one that is hard left of the tombs. In addition to clock hands, you can pair directional placements for those that are still struggling. i.e. “3 o’clock – hard right’. Make sure that you are standing flat on the ground. We found that standing “on” the ice blocks, or even the steps, caused you to change your “z” axis positioning and cause LoS issues. People who were positive they were out of line of sight, and standing right on top of someone else, would end up dying. Breaking the Ice Tombs – One you’ve got placement and survival down, you have to figure out how to actually break free those that are entombed. Breaking out the tombs is why the positioning of the tombs is so important! Have everyone hit their “v” key, so that they can see the health bars for the ice tombs. (This is a recent change, as the tombs didn’t always have a visable bar). NO DoTS! Let me repeat that. NO DOTS!!! You need to time when you bring tombs down very precisely. DoTs ticking on tombs may cause them to break early, killing everyone that was using that tomb to LoS the frost bombs. The simplest way to do this (KISS!) is just not putting DoTs on them, so that when DPS OFF is called on a tomb, it truly stops taking damage. Split your single target melee up so that half go left and half go right. as the ranged work the tombs down, your melee should move between the front and back tombs to help lower their life. Rogues can stand in the middle and Fan of Knives and hit all 6 tombs. Range should AoE the tombs, getting all 6 in their AE. If certain tombs are falling low, they should adjust the area of their AE to prevent a tomb breaking early. If they are unable to adjust their AE, they should move to single target DPS on the tombs. The two center tombs are the tombs that require the most attention, as 100% of the raid generally is hitting these somehow, and they tend to take more damage than the outer tombs. Ranged should not blindly AE. They need to be aware of the life of all 6 tombs, so that they can adjust as needed. Once tombs reach 15% STOP ALL DAMAGE TO THEM. You do not want to release any of the tombs until the fourth, and final, frost bomb has dropped. It is very helpful to have someone call out when tombs start to drop low, and DPS needs to stop on them. This ensures that everyone is aware that the tomb is low…and for those standing behind it to find another tomb, just in case! Once the fourth frost bomb has dropped, quickly free everyone from the tombs. Resto Druid Tip! – Don’t forget to barkskin as the dps frees you out of the tomb. After the fourth bomb drops you will become afflicted with “asphyxiation”, which causes damage to you until you have been freed. Barkskin will help keep your life up, and will buy dps more time to free you. Phase 3 – You are almost there! Only not. Phase three is the most difficult part of the encounter! However, just like normal mode, as long as you have clean execution and patiently work through the dragons life, you should be able to push through to the end! Going into phase 3, you should be in the phase 1 positioning that is shown above. With the raid in the middle of Sindragosa’s body. The first person selected for an ice block in phase three should run 10 yards, and only 10 yards, to the right of the raid and about 10-15 yards back from the dragon to form their ice block. (At this point it will be Sindragosa’s tail). When the second tank taunts, he should taunt from the tail and flip the position of the dragon 180 degrees. The dragon will stay in this position for the remainder of the fight. This prevents ice blocks from having to form on the stairs. Everyone in the raid should go behind the ice block to drop their mystic buffet stacks. Mystic buffet is particualrly nasty, do not let it stack up! Once the raid’s Mystic Buffet has dropped they should slid out from behind the ice block to where the tank healers are, and continue to dps (melee will obviously go back to melee range), regardless of if the ice block is down or not. However, the raid should stay in the position of the first ice block, and should not move back to the center. This will become very important for the next ice block’s positioning! Two healers, unafflicted with unchained magic, should be called out to stay in LoS and heal the tank. These healers should stand right next to the ice block to perform this task. They will have to drop their Mystic Buffet behind the next block. Remember that two healers will need to be selected every ice block. And it will constantly change due to the randomness of unchained magic, and the necessity of dropping your mystic buffet stacks. No two healers will be responsible for the tank back to back. It will be important to communicate who is to heal the tank and who is to drop mystic buffet/heal the raid. Resto Druid Tip! – When chosen for the tank, keep him fully HoTed and fill in with nourish. Additionally, WG the raid, who are standing right next to you, on cooldown to help ease some of the strain on the two healers left out to heal the raid. The remaining two healers will be responsible for the raid behind the ice block. Any healer with mystic buffet should drop their stack behind the ice block. Three fast swinging melee DPS should be assigned to break ice blocks out, more if necessary. All DPS should stop on the ice block at 10% to make sure that the tank has had adequate time to drop their mystic buffet stacks. Communication between the tank and the ice block breakers is imperative. Once the tank has indicated his stacks have dropped, break the ice block. Why fast hitting melee? Well, fast hitting melee will stack up chilled to the bone very quickly on Sindragosa, and will have down time very quickly if on the dragon. Putting them on Ice Blocks keeps those that can provide more DPS on the dragon on her. Rogues, enhancement shaman and feral druids are good examples of this. Assign a “back up” ice block breaker, in the event that one is selected to be in an ice tomb. Nobody should drop backlash in the raid, regardless of what part of the fight you are on! Backlash during phase 3 is exceptionally volatile and can wipe your raid faster than just about anything else. If you have backlash behind an ice block, you still need to run away! Even if it means you gain a few more mystic buffet stacks. Everyone in the raid should stay at the “Ice Block 1” position until the second Ice Block has formed. When a second ice block target is selected, they should move 10 yards to the left, back towards the center of the dragon’s body (your original positioning). This is why it becomes important for the raid to stay by each ice block, even after the block has been broken! Nobody should move until the second ice block has actually formed (this prevents extra ice blocks). Remember, the easiest way to deal with this encounter is to keep it simple! The basic mechanics of the encounter remain the same, just make small, simple adjustments. I cannot recommend enough practicing any changes that you want to make in normal mode, so everyone can get a feel for them and become comfortable with them without having the extra stress of hard mode added. More than almost every other fight in the zone (save maybe LK! ), this encounter will come down to personal execution. And like many things in life, repetition will be the key to success! I hope that there was something you found helpful here! Please let me know if you have any questions, or any additional tips! Good Luck and Have Fun! « Guest Post: Are You Insane Yet? Tips for Insane in the Membrane. Gz for the kill! 🙂 I think we will use your tips in my Guild, can I translate them so my guild mates can understant them better? I found that a warrior-tank can actually not get hit by Blistering Cold. It does work through a .. hmm… limitation of the ability system. When initiating a charge, the location of the charging person is calculated as the “starting” position as long as the warrior is “in flight” and will only update to “in her face” when you actually hit Sindragosa. Basically this means, if the tank runs out, turns around at just the right moment, presses charge and arrives after the whitish blue graphics have played, they won’t take damage – and more importantly, Sindragosa won’t move. And thanks a ton for the “Curse of Tongues” tip. I don’t think we ever tried that – and we run with two warlocks. This is an incredible post and strategy from you. I know I have had a difficult time with this on 10m hard mode and I have yet to find any class specific healing strategies that really go in depth with this – or any period. I will be copying this and throwing it on my guild boards, for a good reference. Very good guide… on thing I would add though as advice to the casters. You wand will not trigger stacks of backlash!! Low DPS is better than no DPS. Move away, drop your stacks, wand her til your debuff is gone then restart your DPS rotation. There's a Penguin on the Telly! What to do with Val'anyr? Val'anyr Proc Explained! And yes...it IS good for druids too! Where Should I Go Again? A Look At Level 80-85 Cataclysm Zones. What Resto Druids Need to Know for 5.4. There’s a Penguin on the Telly! Categories Select Category /rant /shame 3DS Achievements Add Ons Alt-aholic! Archeology Ask Abby Battle Tags Beru is trying to tank! Beru's Book Club Beta Bling Bling Blizzcon Blog Design Blogscars Brade Brain Dump Bucket Lists Casual Play Cataclysm! Celestial Focus Challenge Modes Changes Community Computer Setup Crusader's Coliseum Decisions Deep Thoughts Diablo Do not feed the Trolls! Down Time Dragon Soul Druid Healing Dual Specs Earendiljade Earenn eh? Emblems EZ Mode Firelands Forums FRAPS Furtive Father Winter Gearscore Get Fit While Gaming! Glyphs Goals Goblins Gotta Catch Them All! Grid Guest Post Guild leadership Guild Leveling Guild Management Hard Modes Have a Heart Healing Help! Hey kid…help with these chores How did The Hunters take over The World? I'm giving her all she's got Cap'n! Ice Crown Citadel Idols Isulde It ain't easy bein' green Just for Fun! Just Say No Kitai Legendary Make A Memory Medic! Memory Lane mggrrrggle Moonkin DPS MoP Mushrooms My Muscles Ache! Mynn Off-Topic OMG You Killed Abby! Paladin Healing Patch Day PAX Personal Philosophy Podcast Poke-Beru Power Auras Practice Makes Perfect! Priest Healing Progress Rankings Protodrake Proving Grounds PuGalicious Punch and Pie! PvP Quartz Raid Leadership Raiding Recruiting Rift Ruby Sanctum Rule # 1 – Don't piss off the healer! Sad Tree SAN Shadowmourne Shaman Healing Shared Topic SHOW ME THE MONEY! Sneaking into the Misdirect Club! Strategy Planning Table Top Take two and call me in the morning Tanking The Big Head The Val'anyr countdown! Tier 10 Set Bonus Tier 12 Tier 13 Set Bonus Tier 8 Set Bonus Tier 9 Set Bonus Tree Love Twitter Conversations UI Uncategorized Video Video Games Weak Auras Yogg! You are bad toys! Want Beru in your Inbox? Learn More About Two Night A Week Progression! They aren't trees...but still good reads! Falling Leaves and Wings by Beruthiel is licensed under a Creative Commons Attribution-NonCommercial-NoDerivs 3.0 Unported License.